In this unit students will set up the Eclipse Integrated Development Environment, review basic programming theories and Java programming concepts covered in ICS3U. Students will also study environmental stewardship and ethical issues related to computers and technology. In this unit students will study and implement programming concepts pertaining to one-dimensional arrays. 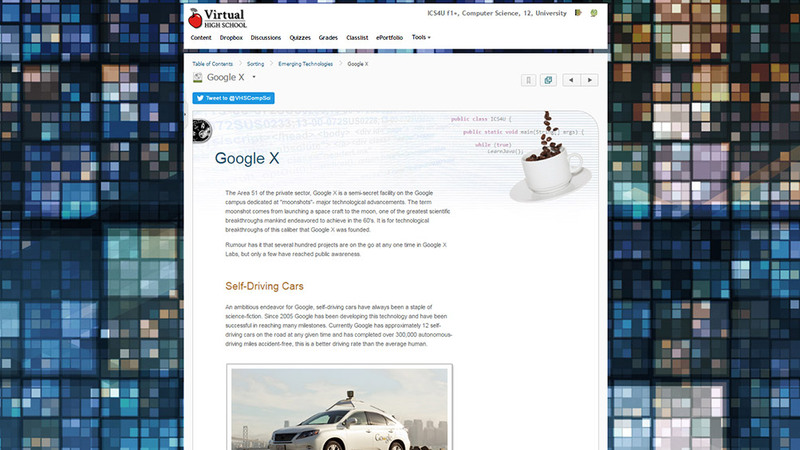 Students will also compare the different careers and fields related to Computer Science. In this unit students will study and implement sorting algorithms such as Bubble Sort and Selection Sort. Students will also investigate several emerging technologies and their expected impact on society such as Energy Harvesting, Vehicular Communication, and Machine Learning. In this unit students will study and implement programming theories related to Object Oriented Programming such as Polymorphism, Method Overloading and Overriding, Superclasses and Subclasses, Abstract Classes, Stacks and Queues. Students will also begin to investigate concepts pertaining to software development such as the Software Development Life-Cycle and Software Development Models. In this unit students will expand their knowledge of one-dimensional arrays to two-dimensional arrays. Students will also study and practice the first stage of Software Development: Requirements Analysis. In this unit students will explore and implement topics such as a GUI (Graphical User Interface) using Java SWING and an executable JAR file. Students will also study and practice the second stage of Software Development: System Design. In this unit students will learn about basic Graph Theory and Linked Lists, they will expand these concepts to implement an arbitrarily sized list in Java using the ArrayList class. Students will also study and practice the third stage of Software Development: Implementation & Testing. In this unit students will study and implement advanced topics such as Recursion, Binary Search, and Algorithm Complexity Analysis. Students will also study and practice the last stage of Software Development: Deployment and Maintenance. This course includes a final project worth 15% of the final grade. Working independently, students will create a robust Java program by following the Software Development Life-Cycle. A4 use proper code maintenance techniques when creating computer programs. B2 apply standard project management techniques in the context of a student-managed team project. C2 analyse algorithms for their effectiveness in solving a problem. D4 research and report on different areas of research in computer science, and careers related to computer science. Communicating: Through the use of discussions, this course offers students the opportunity to share their understanding both in oral as well as written form. They also have the opportunity to broaden their understanding by discussing concepts with other students and their teacher. Problem Solving: This course scaffolds learning by reviewing basic knowledge attained earlier in the course and in prior computer science courses and building off of this knowledge as the student progresses through the course. The course guides students toward recognizing opportunities to apply knowledge they have gained to solve problems.